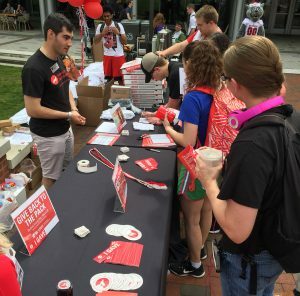 Due to its central location, the Student Giving Day tables drew in many curious students who stopped to learn more about why student philanthropy is important. Participants enjoyed games, food, T-shirts and tie-dyeing while engaging in conversations about how giving back to the university makes NC State a better place. Seniors who chose to make a $20.17 gift received philanthropy cords to wear at graduation to formally showcase their commitment to the university. Makeila Bowers, a senior in science, technology & society, was inspired to give by her mother who had always wanted to attend NC State. As a surprise, Bowers made a donation in her mother’s name to say thank-you for all of her love and encouragement. Student Giving Day helped to grow the student body’s awareness and involvement in philanthropy. Last year, approximately 1 percent of NC State undergraduates gave back to the university. This year, more than 4 percent of undergraduates chose to participate in Student Giving Day.